International Women's Day (IWD), also called International Working Women's Day, is celebrated on March 8, every year. There were a series of Wikipedia events organised this year with the aim of increasing participation of women contributing to Wikipedia. 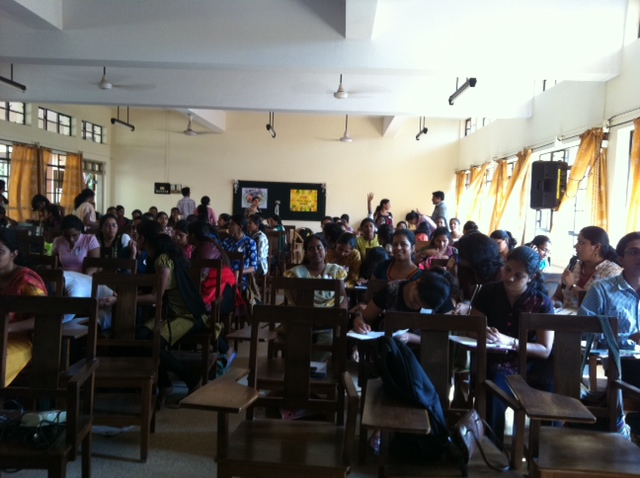 One such event was organised by the Access to Knowledge team at the Centre for Internet and Society and the Wikimedia India Chapter at the Nirmala Institute of Education (NIE), a Secondary Teacher Education College in Panaji, Goa on March 8, 2013. NIE is a respected institution providing pre- and in-service teacher education to thousands of teachers and about a 100 of them (99 per cent of the participants being women) joined in to learn Wikipedia editing and increase women related content on Wikipedia. 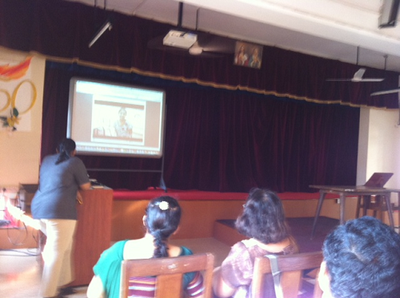 How to integrate the new community of editors in Goa with the larger Indian and global community? How can teachers and students use Wikipedia to advance students' knowledge and add useful content to Wikipedia? To answer the first part, participants were informed about regular Wiki meet ups in different cities, several city based and language based Wikipedia mailing lists where one can find volunteer friends, active use of user talk pages and village pumps, Wikimedia India Facebook page amongst many others. To address the second part there was also a brief discussion about wiki project classroom coordination with specific examples from universities around the world. The teachers and faculty members will be sent a detailed outline of the program, list of universities with on-going projects, list of teachers who have used Wikipedia as a teaching tool and are willing to serve as a contact to help others set up a similar teaching courses. The session was planned to go on until late evening with hands on editing in the computer lab. But unfortunately, we (Rohini and Nitika) were informed that the session will have to close before the scheduled closing time as participants had to leave. Except for two or three participants coming on stage and making their user accounts and another 3-4 article edits, we couldn't include more editing as a part of the outreach session, primarily due to time constraint. We're hoping that at a small percentage of participants would try actual editing at home and contribute to women related articles and some of them will be successful in using Wikipedia as a teacher's tool. We have their contact details and we'll try and monitor their on Wiki activities and provide them support whenever needed.